This post was initially published December 2015 and updated and republished January 2019. 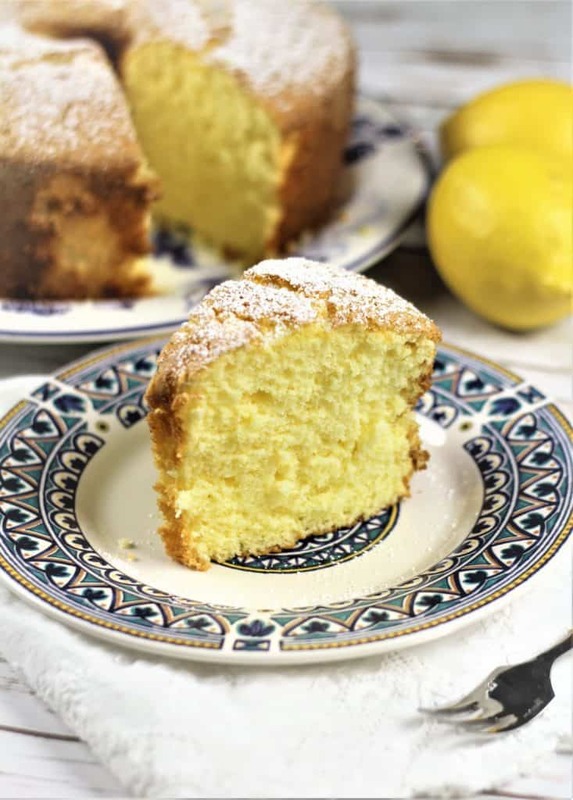 Nonna’s Sponge Cake, this is that perfect lemony, fluffy and airy cake that most Italian nonnas make to perfection! I was intimidated by this cake for the longest time. The cake that I call Nonna’s Sponge cake. I’ve tasted endless versions of it made by Italian nonnas everywhere. Each one of them bursting with pride as they serve their delicious, fluffy creation and share their tips and techniques for the perfect cake. What sets one cake apart from the other and determines the successful outcome is the height, the dramatic height! 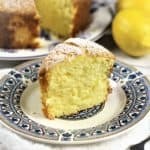 Each time I take a bite I’m in awe at how Nonna’s Sponge Cake, such a simple cake made with few ingredients could be so utterly amazing! I finally decided it was time to overcome my intimidation with this cake. I was at a bride’s home this fall on her wedding day (in case you were not aware, at Italian weddings there’s always a pre-ceremony buffet at the bride’s parents home). Once again, I came face to face with The Cake! I quickly sought out the baker of the cake and, of course, it was the nonna of the bride. It lay on the buffet table untouched. I had to slice that first piece for me. Heavenly! I immediately began to praise her and, like nonnas everywhere, she explained that it was such an easy recipe and she could practically make it blindfolded. She then began to list the ingredients, which as you could imagine, she knew by heart. I quickly pulled out my cell phone and jotted down the ingredients and quantities. She did not specify any instructions as it’s obvious how to put a cake together, isn’t it? What do you need to make this cake? One week later, I attempted it without much success. Although the flavor was wonderful, it didn’t have that dramatic height. The only thing I knew for sure, is that you have to invert the cake pan immediately when you take it out of the oven. It must remain upside down until completely cooled in order to get that light, fluffy texture. This is the two piece tube cake pan with prongs that is necessary in order for air to be able to circulate underneath the cake while cooling. Watch my video on how to make Nonna’s Sponge Cake! Separate the eggs. 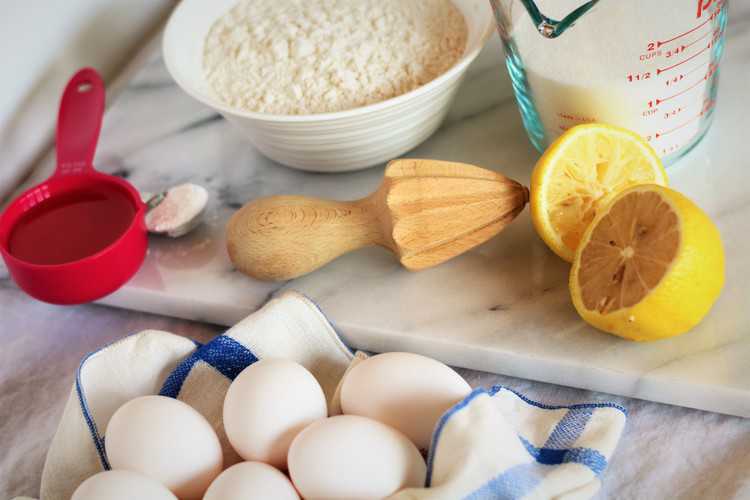 Place the yolks in a large mixing bowl and the whites in the bowl of your stand mixer. 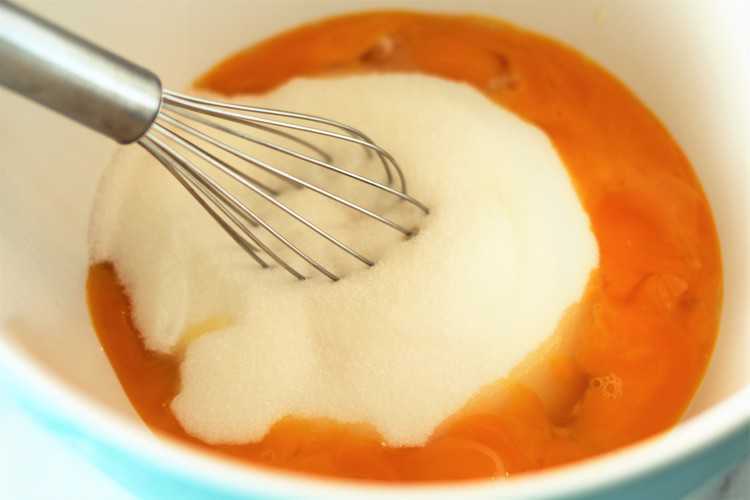 Add sugar and vegetable oil and whisk with the egg yolks until you have a smooth, pale yellow mixture that forms ribbons when you lift the whisk. 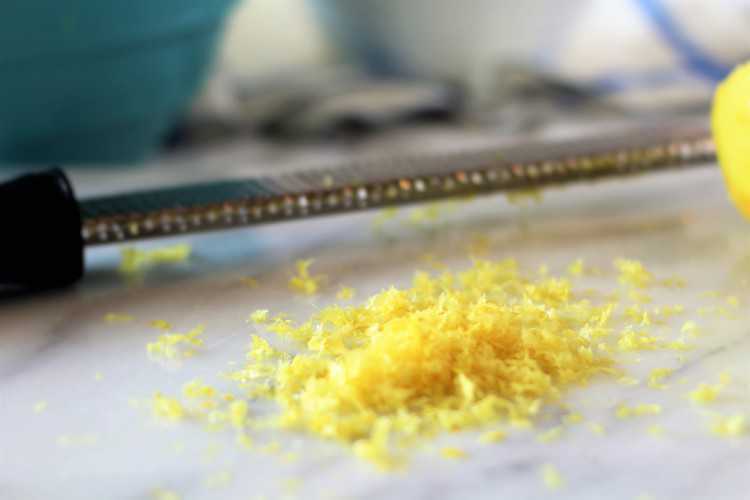 Add the lemon zest and lemon juice and combine. Sift the flour and baking powder and stir into the egg mixture. Finally, beat the egg whites until stiff peaks form. Fold half the egg whites into the batter, then carefully stir in the remaining half. Grease the cake pan with butter and dust lightly with flour before adding the batter. Bake in the center of a 350F preheated oven for 50 minutes. When the cake comes out of the oven it must be carefully flipped over in order to cool completely. Carefully unmold it from the pan, dust lightly with powdered sugar and serve! 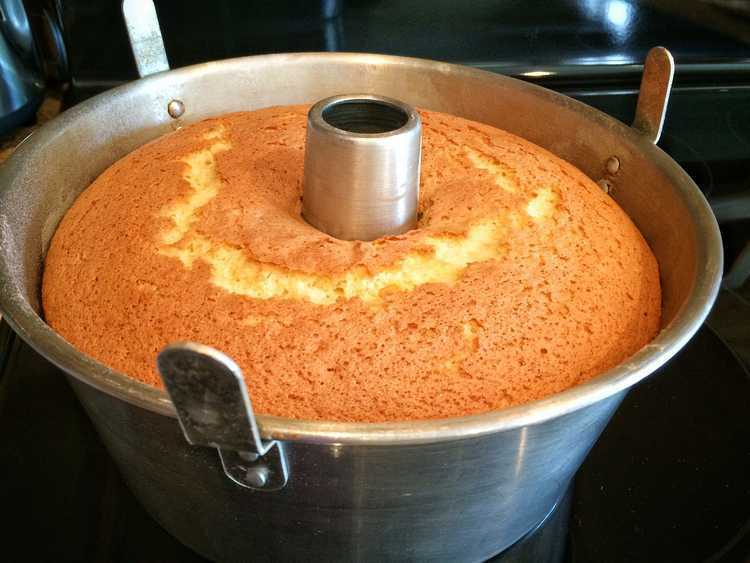 A two piece tube cake pan or angel food cake pan with extended prongs is necessary to make this cake. 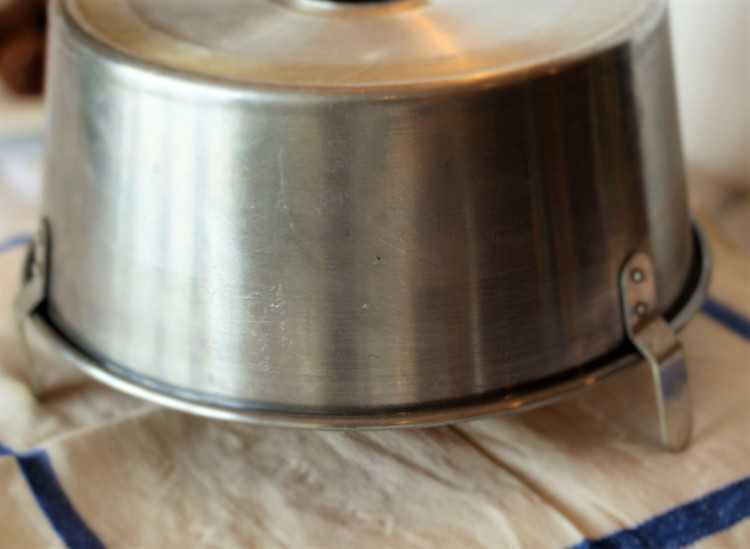 When the pan is inverted it will stand on its prongs thus allowing air to circulate underneath to cool it. Do not over flour the cake pan otherwise the cake may slip out when inverted. If the cake partially dislodges itself from the pan, leave it be and let it cool completely. For best results, the eggs should be at room temperature. Do not over stir the mixture once you’ve added the egg whites. Stir just until the egg whites are incorporated as the batter must remain light and airy. So, you may be thinking, all this for a sponge cake? Yes! Believe me, it’s all worth it. All it requires is a dusting of powdered sugar and you’re set. No fancy icing, layers, sprinkles, chocolate chips or anything else. This cake is perfection! I’m still working on getting more height on my cake. Recently a relative baked one for me. I actually measured the cake and it was 11.2 centimeters high! I’m challenging each of you who loves to bake to try it out and let me know how high yours turns out. Meanwhile, I will continue baking this cake until I reach this height. Good luck to all of you! I almost forgot to mention something! 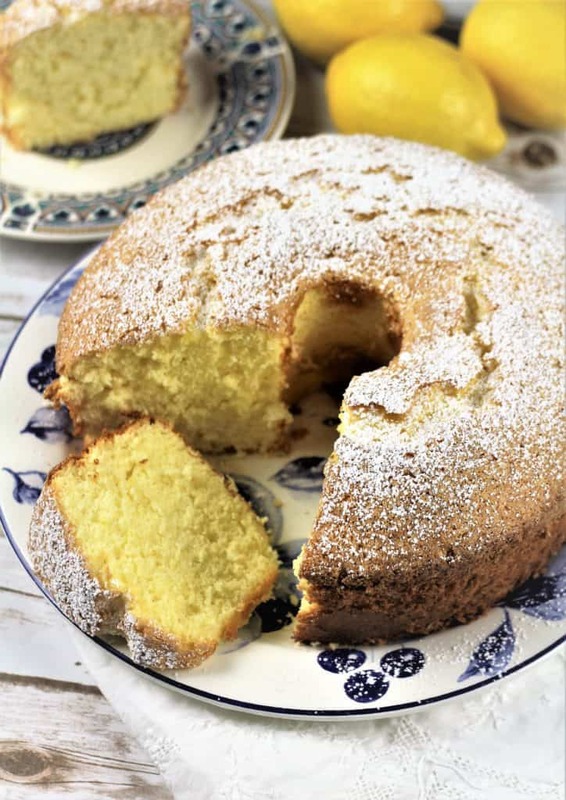 In honor of all the dedicated nonnas out there who bake this cake, especially those who deliver one to me, I have decided to simply name the cake Nonna’s Sponge Cake! I can’t wait to hear how your cake turns out. Let me know by tagging me with photos of your beautiful cakes with @mangiabedda or #mangiabedda on Facebook or Instagram. Enjoy! 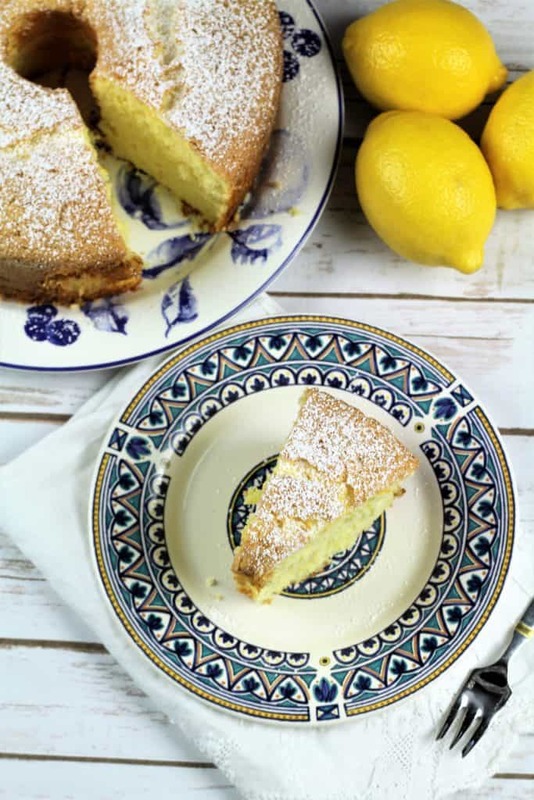 Light, fluffy and airy, Nonna's Sponge Cake is the cake that all Italian nonnas make better than anyone else. A must in all Italian households! Preheat oven to 350°F and lightly grease a two piece tube pan with butter and dust lightly with flour. Shake out excess flour. Separate the eggs placing the egg yolks in a large mixing bowl and the whites in the bowl of your stand mixer fitted with a whisk attachment. 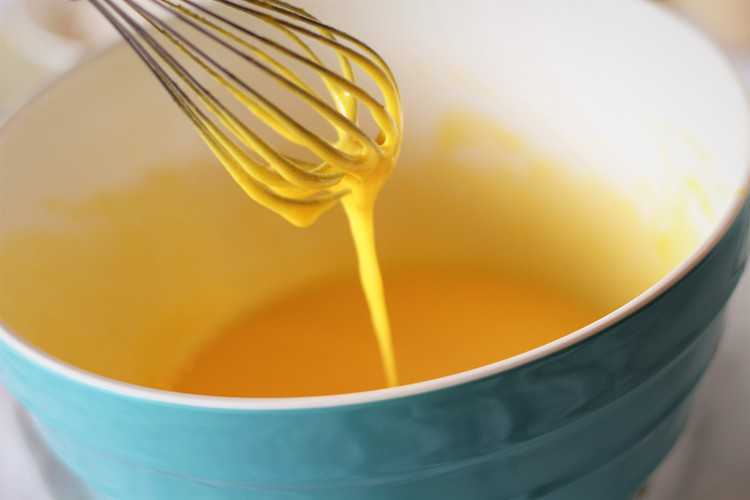 Add the sugar and oil to the egg yolks and whisk vigorously for several minutes until the mixture is pale yellow, thick and forms ribbons when you lift the whisk out of the bowl. Stir in the lemon rind and lemon juice. Add the sifted flour and baking powder. Stir until well combined. 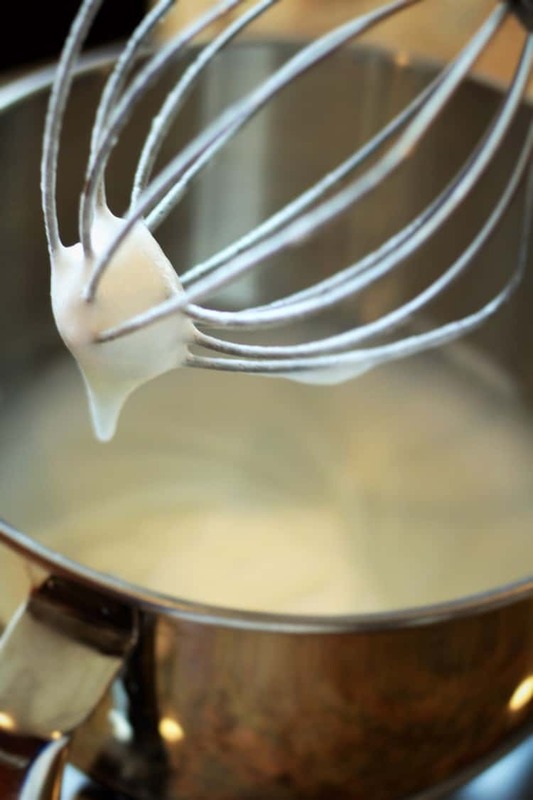 Whisk the egg whites in the mixer on medium-high speed until the whites form stiff peaks, about 3-4 minutes. Using a rubber spatula, gently fold half of the egg whites into the batter. When completely incorporated, fold in the remaining egg whites. 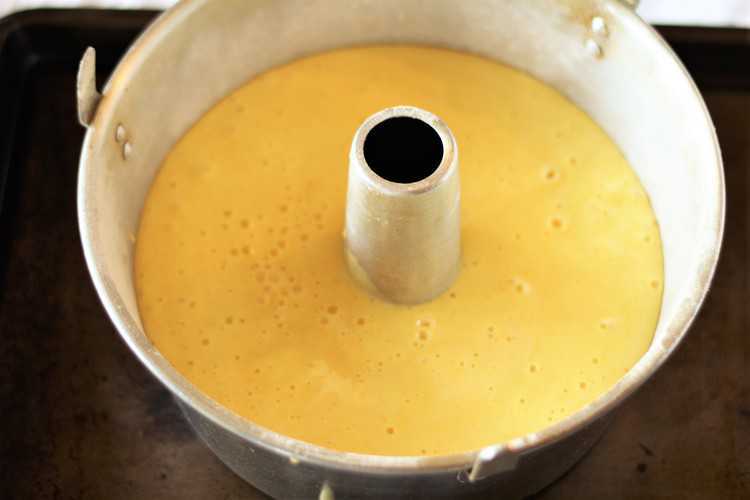 Pour the batter into the prepared cake pan and bake for 50 minutes in the center of the oven until a toothpick inserted in the cake comes out clean. Time may vary according to your oven. When you remove the cake from the oven, gently turn it upside down on a flat surface and allow to cool completely before unmolding the cake, about an hour. Dust lightly with powdered sugar before serving. Do not over flour the cake pan otherwise the cake may slip out when turned upside down. If the cake partially dislodges itself from the pan, leave it be and let it cool completely. Do not over stir the mixture once you've added the egg whites. Stir just until the egg whites are incorporated as the batter must remain light and airy. Beautiful cake, no frills, just few good ingredients and a delectable flavor. I am a fan of those! Looks wonderful Nadia....my mom would have called it Ciambella ???? Thanks Marisa, no one I asked had a name for it! Still me :-) If you want a name, in Italy we call it "Ciambellone" :-) . Thanks! I should have checked with you guys first! This sounds like a chiffon cake my mom used to make. Try baking it in a ungreased tube pan. It should raise a lot higher. Yes basically it is. The nonna that gave me the recipe told me she greases it. Will it come out if it is not greased? Thanks for your feedback! I too make this sponge cake. I have never greased the pan though. I was told it won’t rise as high. You just carefully run a knife along the outside to release it. Your cake looks lovely! I think I will go bake one now! That's interesting, I was told I should grease the pan but I think I'll try your way next time. Always looking to get more height on my cake! Thanks for stopping by my blog! The one I make calls for 7 eggs and sometimes instead of the lemon I use an orange(rind & juice) to change the flavor but I never grease the 2 piece tube pan. After it has cooled completely run a knife around the pan and also around the tube and flip it over, it will still be attached to the bottom part which I then run a knife between the cake and the pan and slides right out. Hi Gina, yes you can use orange instead of lemon in this recipe. There is lots of debate about whether to grease the pan or not. The Italian nonna who shared this recipe with me lightly greases her pan. There are many others who have told me that they do not grease the pan. I think next time I'll try not greasing the pan and see what happens. Then I'll share my results with everyone. Thanks for your comment! This was my mother's chiffon cake.....To this day I still make it and I'm 79.. I also make it in a large round pan which is scalloped. I slice it and fill it with an Italian cream filling and topped with whipped cream. DELICIOUS. Try using vanilla extract in place of the lemon. I think the lemon flavor is best when you serve it plain with powered sugar on top. That sounds delicious, I must try it one day! Thanks for your feedback and for stopping by my blog! 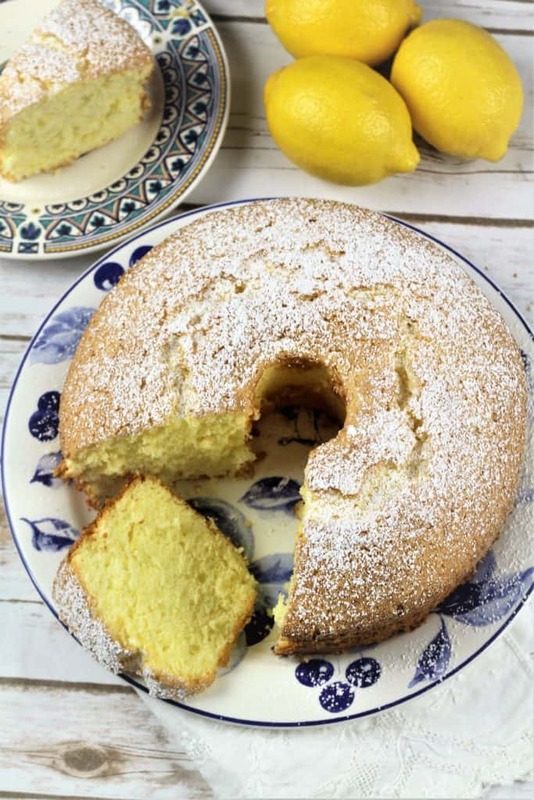 Hello Nadia Your sponge cake recipe is very similar to my own which was also given to me by a nonna ( my husband's aunt). Its a no fail recipe. It always comes out nice and high! 14" high! The only differences are i add 3/4 cup pure orange juice, 3 tsp of baking powder, 2cups flour, 1/8 tsp salt, 1/2 cup oil. I dont add lemon or its juice. Just orange rind. Maybe these small changes in measuements will give more height in your cake. Adding the salt is very important because thats what activates the baking powder. Hi Maria, thanks for sharing your recipe! It’s interesting but most nonnas I have spoken to don’t add any salt ti their cakes and they have that incredible height. I’ll have to test out your suggestion. Thanks for your feedback and for stopping by my blog! Hi Maria, I want to try your version of Nonna’s cake. Can you send me your recipe using the orange juice. Hi Jenny, for the orange juice version you would simply follow the same recipe and replace the zest and juice of the lemon with the zest and juice of one orange. Thanks for your question and hope you enjoy it! Hi Rosemary, hope you enjoyed it! I actually do grease and flour the pan. I'll try your mom's suggestion to not completely incorporate the egg whites and hopefully mine will rise even higher. Thanks for stopping by my blog! Thanks for the recipe … I grew up with this cake and making it brought back many wonderful memories ! I greased my tube pan with shortening and dusted it ever so lightly and lined the bottom with parchment paper . I remember my mother doing this and it always turning out beautifully ! All said and done the aroma is wonderful and the height was 101/2 cm … now you have me wondering if I could go higher ! Will definitely do this recipe again ! Thanks for sharing ! You’re welcome Rossana! I know I’d like to try getting mine higher for sure! I just put one in the oven. I’m not a baker but I followed your instructions exactly. So in 50 minutes plus cooling I’ll let you know, can’t wait! Excellent, crossing my fingers! Please let me know!